Last May, to coincide with the opening of Paris je t’aime, I did a piece for MSNBC on the Top 5 films set in Paris. Basically it was an excuse to see more French films before a bike trip along the Canal du Midi in June and July, but, unfortunately, I didn’t have the depth of knowledge you’d need — or the space, really — for a good piece on the subject. I still don’t have the depth of knowledge (the more you know, the less you know), but a new list, or at least an addition to the list, might include Bob le flambeur, Jean-Pierre Melville’s 1956 take on an aging gambler and a perfect crime caper. Those shots around Paris from a speeding car window in 400 Blows? Melville does it four years earlier around Montmartre: Gorgeous shots of a life that doesn’t exist anymore. For a genre film, made a few years before Truffaut, et al., broke, the movie feels very New Wave. Many films are suggested in this one. A shot of Anne (Isabelle Corey) dancing alone to a jazz band reminded me of something Roger Vadim did with Brigette Bardot in Et Dieu...crea la femme — which also featured Isabelle Corey. Obviously The Good Thief, with Nick Nolte, is a direct remake, but there are also strong elements of Bob (the debonair, moralistic gambler with the young protégé) in Paul Thomas Anderson's Hard Eight. For all the great metaphoric use of Montemartre as both heaven and hell (from Sacre Coeur to Pigalle), and for all of Henri Dacae's gorgeous early-morning cinematography, what’s interesting about the story, and please accept all the usual spoilers here, is how it upends the perfect-crime caper. A gambler (Roger Duchesne), on a losing streak and near broke, decides to rob a casino with the usual team of handy and not-so-handy men. He drills them like a military unit. Parts of the scheme begin to unravel (an informant tells the police), solidify again (the informant is killed for other reasons), and the whole thing’s set in motion even as the police close in. Then the reason why it was necessary in the first place unravels. 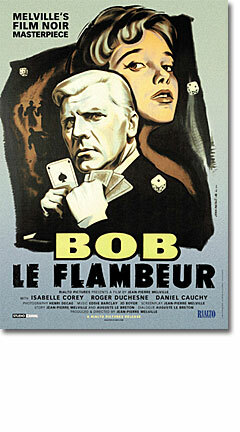 Bob, the point man in the casino, begins to gamble and his luck begins to change. He keeps winning, and winning, and he forgets all about the caper. After several hours he remembers, but his men and the cops arrive at the same time, there’s a shoot-out, and Bob’s protégé, Paolo (Daniel Cauchy), is killed. That’s a good take on the heist film. The heist never happens but the hero gets rich anyway. The denouement includes a good conversation between the cops and Bob on how much time Bob will do and what a good lawyer can buy you. This is my fourth Melville film (Le Samouri, L’Armee des ombres, Le Cercle Rouge), and while I like him intellectually, his cool may be too cold for me. His leading men don’t intrigue. For all of Bogie’s cool, remember, he was one helluva talker.